BookCrossing - FREE YOUR BOOKS! Inspired hearts / Conjoined in hope / Effect change. News Hounds: We watch FOX so you don't have to. 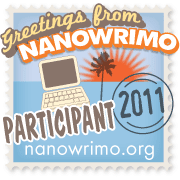 I am reading for The Office of Letters and Lights the folks who bring us NaNoWriMo today as I love what they are doing for literacy with their Young Writer's Programs and because I've participated in NaNo every year since 2004. I have been blessed to have it in my life and would like to give something back if only kudos and link love. I'm putting this plug at the top in hopes some who stop by will check out their site and see all the great things they do to foster love of reading and writing and story in kids. This post will be organized like a blog inside a blog with recent updates stacked atop previous ones. I may be posting some updates on Twitter @Joystory and the Joystory fb fanpage. But this is where I do anything more than a line or two. Including mini-challenges that don't require a separate post..
4:44AM - l am prepping this ahead and scheduling it to post at 4:44 AM which is also when my alarm is set. That gives me time to get up and take care of biological business including fixing coffee and water bottle. Am including the intro meme here so I don't have to spend the first hour preparing it as so often has happened before. In fact much of it is copy/pasted from previous Thons. 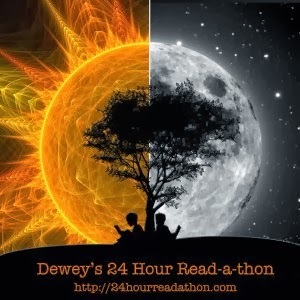 I'm going to spend the first hour actually reading! Longview, Washington USA situated in the V formed by the Cowlitz and Columbia Rivers. Across the the majestic Columbia river from Raineer, Oregon.. On the north side of the majestic Columbia River approximately 50 miles from the coast and 25 miles from Portland, Oregon as the crow flies but drives about double that..
At my Mom's house. The house I lived in from age 18 to 21 (or 1975-78) and again since January 2013. See earliest posts under the label Lifequake for explanation. But mostly as always I'm looking forward to free range reading. The most important part of my plan for this thon is to not have a plan. That's basically been my thon plan every time for several years now. It much more fun that way. Less stress. I'm legally blind from RP aka Tunnel Vision with less than 2 degrees of vision left. I can no longer read even large print with my left eye. I now prefer ebooks for the ability to enlarge fonts and control line width so I don't loose my way between end and beginning of lines. I used to read nearly 1K words per minute but now read slower than I talk. Very discouraging. But in the last year I've started listening to audio books via my access to LOC Talking Books and BARD. And also via text to speech. And often I speed up the delivery to between 110-175%. I discovered that I listen better when i listen faster--better focus, comprehension and retention. I think it's an Autism thing. I've come across it in the spectrum memoirs several times since my diagnosis four years ago. I intend to use audio predominantly this thon so I can crochet and/or continue my ongoing sort and organize project while I listen. I'm continuing the ongoing project of getting projects finished. There are dozens of them in various stages. I have several with me that have been stuffed in a bag under my craft table for two years needing only to have their tails tucked, a tassel or fringe attached or a few snags fixed. Am working on several late Xmas projects I hope to have ready for Mother's Day and/or some early summer b-days. And a shawl for my mother-in-law whose birthday is at the end of this month. And several projects begun as CAL last fall that are for myself so have gotten neglected since Thanksgiving when my attention shifted to Xmas. I've had a mood disorder since childhood featuring depression, anxiety, panic and insomnia. Several times professionals have considered the possibility of bi-polar but finally ruled it out definitively in late 2015 when they diagnosed me with High Functioning Autism aka Asperger's. Over fifty years of feeling 'wrong' and not knowing why. I've spent the months since reading nf about the autism spectrum and novels and memoirs featuring autistic individuals which has gone a long way toward helping me understand much that once confused and shamed me. Since I have several of those books in progress I'll probably dip into them today. I would like to participate in the challenges and visit other readers which I've done little to none of the last several thons having got lost in the reading. Advice to newbies and vets alike: Stay hydrated! Get up and move once an hour. You can read while you pace you know. Blink. Seriously. Dry eyeballs can't see. And the hands rubbing them can't hold books. 3:33AM (Sunday) - Have been reading The Life of Pi by Yann Martel via text-to-speech since midnight. Have a good chance of finishing it by 5am which is thon end for me. But i may be taking it to bed with me before the end which means I won't be updating again until I wake up. 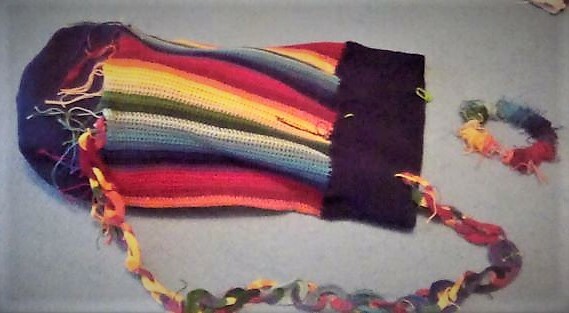 As for the yarn work while listening to yarns--I made a few rows progress on the loom knit dress but ended up spending several hours working on a snarl that came out of the center of the cake when the working yarn got stuck and to get it free I had to pull out a clump of loops. Still haven't got it unsnarled completely but I got it into a good enough state that it was safe to pack it for transport back to Mom's. I would like to work on the Xmas gift for my husband again before I got to bed but my eyes are rebelling and I have a sense I'm prone to error so chances are that any progress I make is likely subject to frogging later so it's wiser to leave it be. Am I wise enough? An amazing story. Am so tempted to start it over so that I can read the first half with the ending in mind. 4:44PM - I guess I've been too wrapped up in yarn and yarns to think about updating. The book I started the day with was Look Me in the Eye by John Elder Robinson. It was my second read of this memoir of a man who was diagnosed with Asperger's syndrome in his late 30s. The first time I read it tho was in 2009 over half a decade before I received my own diagnosis. That time it was a library tree book. 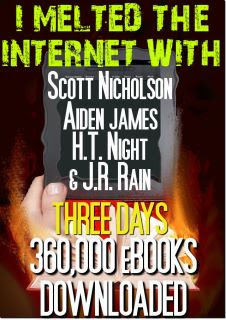 This time it was an ebook that I had read to me with text-to-speech function. I finished it before noon and then immediately started the second memoir about raising his son 'Cubby' who was himself diagnosed as a teen. I didn't get past the first chapter tho. I needed to stop for self-care. After I settled again it was after noon and I started the novel The Miracle Life of Edgar Mint by Brady Udall (Audio via BARD ) I'm nearly halfway into it--over 5 hours of the stated 14. But I'm listening at 150%. Not sure what that means precisely regarding how long I've listened and much longer to go but I think based on previous reads at this speed that it's approximately one third of the listed time based on 100%. Meanwhile I've also progressed on two crochet projects. One a blue and white winter scarf for myself that I began over two years ago and an Xmas gift for my husband that I began this week and estimate I'm a quarter done. Tho not an afghan it is an afghan sized project so that is speedy for me. I worked on it for two hours this morning while he was running errands and hope to work some more after he goes to bed. Meanwhile I think I'm going to work on my loom knitted dress while I continue listening to Edgar Mint. Kelso, the sister city across the Cowlitz river from its sister-city Longview, Washington USA which itself is situated in the V formed by the Cowlitz and Columbia Rivers. Across the the majestic Columbia river from Raineer, Oregon.. On the north side of the majestic Columbia River approximately 25 miles from the coast and 50 miles from Portland, Oregon as the crow flies but drives about double that.. I'm spending the read-a-thon weekend at my husband's apartment tho I still live in Longview at my Mom's house. The house I lived in from age 18 to 21 and again since January 2013. See earliest posts under the label Lifequake for explanation. Maybe by next thon It won't be just a weekend visit. One can hope. I'm looking forward to the surprises my husband brings home tomorrow morning or afternoon. He always did the thon food shops for me from 2007 to 2012 when we lived in Phoenix Oregon. (except for a couple times when I was in Longview helping my sister with our Mom's care) and he always managed to surprise me with items I hadn't asked for but ended up enjoying more than most of what I had asked for. But in the last year I've started listening to audio books via my access to LOC Talking Books and BARD. And also via text to speech. And often I speed up the delivery to between 110-175%. I discovered that I listen better when i listen faster--better focus, comprehension and retention. I think it's an Autism thing. I've come across it in the spectrum memoirs several times since my diagnosis three years ago. I intend to use audio predominantly this thon so I can crochet while I listen. I'm continuing the ongoing project of getting projects finished. There are dozens of them in various stages. I have several with me that have been stuffed in a bag under my craft table for two years needing only to have their tails tucked. Then I have several small projects, a hat, two scarfs and a headband with bow each at least half done with stitches/patterns that take little to no thought. I also have my husband's Xmas present to work on after he goes to bed. And a dress for myself that I'm loom-knitting. When I started it in August I hoped to finish by my birthday in mid November but if I don't make significant progress on it this weekend I may have to adjust my expectations. The most important difference is actually sleeping the night before which was made necessary by having not slept Thursday night because of packing and anticipation. Early this morning I began the section section of Havana and got four rows in before I realized that I'd taken my foundation single crochet row to the pattern and began Row 1 on top of it. In other words I started following the patterning using MC instructions for CC colors and visa versa. I dithered for more than an hour over whether to frog it out and redo from the beginning of row 2. But I had no heart to either do it or decide not to. So I set it aside and went back to work on another project begun several weeks ago and went to town on it all morning and again in late afternoon. At some point I decided it was time to pull out the first one of the several now nearing completion.to compare and measure only to discover there was a significant discrepancy in size between the first and the rest. The first being the correct size and nearly one fifth smaller. Somehow I'd allowed three different sized hooks to end up in the project bag and was pulling them out willy-nilly.--I, J and K. I'd been using K for awhile and I know for sure I had not selected it intentionally. 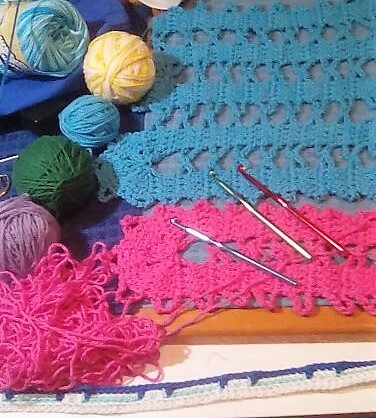 But since I use I and J frequently and often dither between them at the beginning of a project I can't remember which one I settled on when I started that blue Bruge lace piece. Measurements are important for the functions they have in their project. So there was no choice but to frog them all. Three total including the pink which I was nearly done with before I realized I hadn't got pictures first. Looking at the picture now I'm asking myself what was I thinking not winding that thread as I pulled it out. It might have worked out if I'd wound it up directly off my lap without disturbing it.... But now? That's going to be a mess. Tomorrow tho. Not tonight. And I've now decided that one froggy day is enough so I will not start tomorrow off by frogging those four rows of Havana part 2. I'm just going to go with it and let the rainbow play at being MC for one panel. Saturday began with having to take out most of rows 16 and 17 and put them back in to fix two snags and the curl caused by accidentally switching hooks from H to G or 5.0 to 4.25mm. 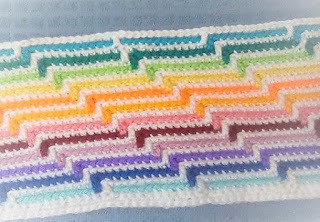 I was able to add two more rows to the end of row 19 before quitting in the wee hours of Sunday and then Sunday afternoon added two more rows while away from home. 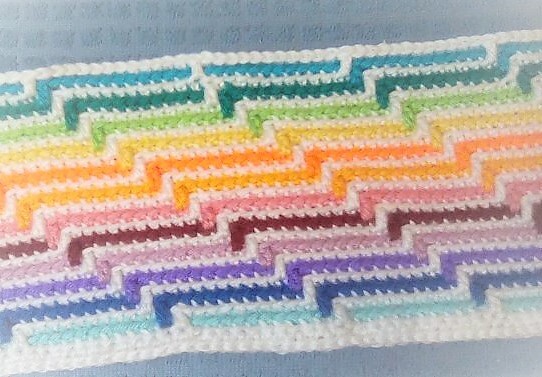 Today, day 8, I added rows 22-25 which also completed my 12 color rainbow plus one white. 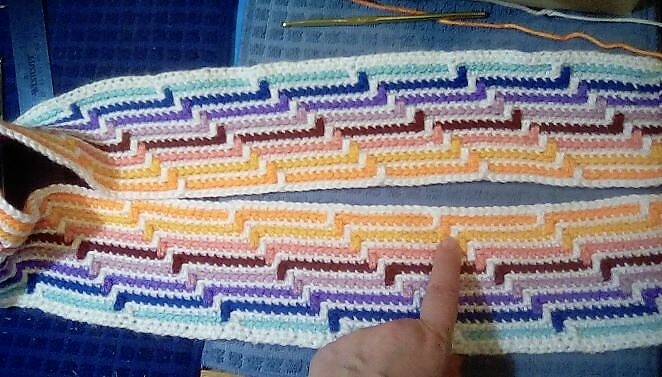 Have stopped to contemplate my plan to reverse color order to make a mirror image of it as that would take it to 48 rows. Still like the idea well enough to go the extra rows I think. But I'm too excited about the week 2 pattern to wait so I'm going to start it first and go back and forth between them. I'm going to be working each week's pattern in separate panels as I"m making a cape or cardigan instead of a blanket. This also has the benefit of keeping the project portable until time to assemble it. August 1st - Rainbow What? Even before I entered the Quilter's tote in the fair August 1st I'd targeted this project as the next one to get priority focus. And it did for over a month until I got captured by CALs. 3 so far. 3 more tempting me. It is also time to shift focus to Xmas gifts and since this Rainbow bag and the Havana and Ubuntu CALs are all for me their priorities are going to have to shift down several notches. But I don't want to quit on any of them--just slow down. Maybe a few rows on one of them everyday as a reward for that day or the previous day's significant progress or completion of an Xmas gift. The 3rd CAL is Xmas gift related which is how I justified joining and will be the only way I'll justify joining any more before January. I considered rows 12-17 as all belonging to Day 5 because I didn't put it down until 6 am this morning. Woke raring to go at noon but while preparing to mount next color of yarn for row 18 I discovered two loops with significant snags atop each other in the top two rows nearly back to the beginning. Had to take out rows 16 and 17 to end of second iteration or back to approx the 44th stitch. I usually pin the curling edges for the pics but left them this time to showcase what I think contributed to my not seeing the snagged loops before I cut off the skeins. That curl actually formed almost a tube that I had to smooth out as I inspected the row backwards before starting the next row. Being visually impaired doesn't help. While the work was still narrow it wasn't so hard to do it without laying it down on a flat surface and holding it open with both hands. I guess that's what I'll have to do at the end of every row now. So disheartening. Still hadn't frogged it as of 6pm Pacific Coast Time. Then I realized I didn't have to suffer alone. I had a resource in the CAL group's fb page. So I took the pics at top of this post and posted them there and withing minutes got back several replies all suggestion it was a tension problem and maybe I could try going up a hook size. That's when I looked at my hook with magnifier and realized it was a size G and I was sure I settled on an H when I started. That's a difference between 4.25 mm and 5mm. There followed a frantic search over the craft table and floor around it and among the WIP kit bags I was wearing yesterday and those hanging off the edge of the table and then in all the skeins I'd cut free and returned to the big Havana CAL kit bag. I finally found it in the white skein still in the kit bag I wore yesterday. My next dilemma was whether to frog back further than the snags to where the stitches first tightened. I looked and felt to me to be another two rows down. I decided that I should try putting part of the orange row back in with the H hook first to see if there was a visible difference. And lo there was. After only two iterations of the 12 stitch repeat it was already significantly less curl. So I kept going and by the time I got to the end of row 16 again it was hard to tell there was an issue. By the time I got row 17 back in I was able to smooth it flat for the picture with only one pass of my hands over it. No pins needed. It's almost midnight and I've not yet added more rows. So I guess Day 6 is a wash. 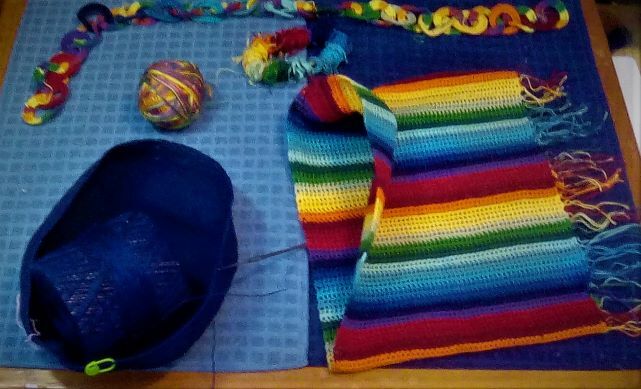 This post is about the crochet projects that have come off the hook since the first of August when I was able to break the ice on my WIP stash after getting that 2012 Secret Santa Quilter's Tote ready to enter in the Clark County Fair. For the foreseeable future I hope to post reports on finished WIP every Friday. Maybe soon that will include writing projects but for now I will focus on fiber art, my sort/organize projects.and any other significant task accomplished. I will pick another day to feature one or more WIP as I continue to paw through the dozens put on ice while I focused on the Quilter's Tote and those I begin as the holiday season progresses. 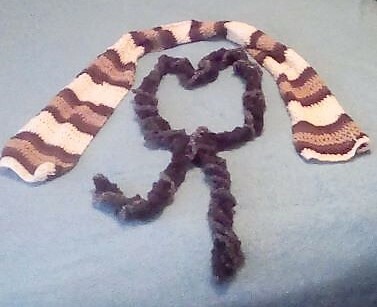 This skinny scarf was requested by my sister for her friend's birthday over two years ago! She was going to pay me for it. When I found it in my stash, I quickly finished it in about two hours. When I gave it to her she was surprised as she had forgotten about it. I told her she owed me nothing because of its lateness. This was an original design. I made several of them in the year before I started this one. Essentially I sculpted it as I went. 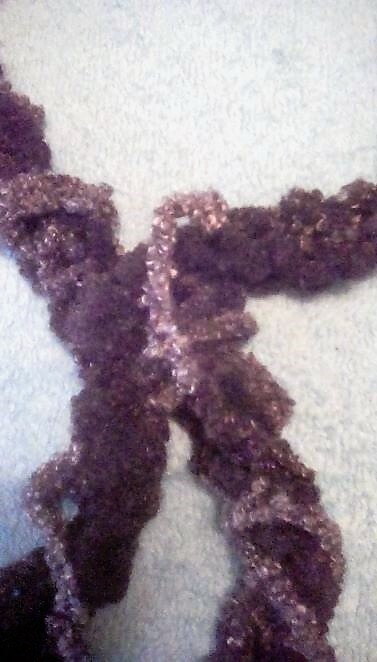 I wanted it to spiral so I started with a foundation chain of the approximate length I wanted and then started chaining six and single crocheting into a chain about every four chains. On the return pass I put the single crochets in between the first 'row' but on the back side of the chain. On the third pass I again put the single crochet between two of the others but this time I started alternating top and bottom of the chain which caused the twist. I think I may have switched between top and bottom of the chain less often than every other single crochet. I seem to remember that I put several on one side before switching to the other again. 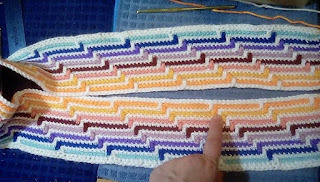 On the forth and fifth pass I switched randomly between four, five and six chain loops with the single crochet in the loops of the first layer and also randomly moved over a row clockwise which emphasized the twist. The yarn I used was Buttercream Rainbow Boucle in black and white and shades of grey. But since the color change was so slow not much of either black or white ended up in the scarf. I fell in love with this yarn while working on this scarf and went looking for more only to find that Luxe Craft has discontinued it. I got two skeins over three years ago at a January inventory reduction sale at Joanne's. The other skein is Blues and Teals and is currently on my Martha Stewart loom as my second loom knitting project. It's a large tube that I'll make into a garment. A dress if it's long enough else a tunic; I plan to do the same thing with the grey scale skein. I started this scarf over two years ago for my husband. I finished it for his birthday in late September. It is made with Plymouth Diversity sock yarn in a white and browns self-striping colorway that is very elastic. I loved this yarn and have a scarf for myself on the hook in a grey/black/white ombre. This yarn has been discontinued as well. So the stitch or pattern I might have created is simply a six chain loop attached to the row below with single crochet.with one or two stitches between; For the first row of loops that would be into whatever stitches are in the row below. 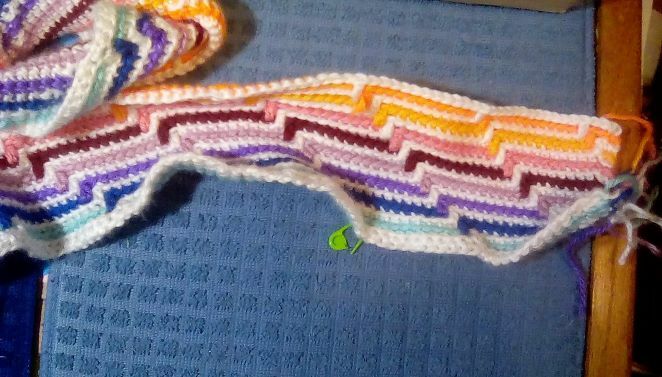 Every time I've used it so far I've made a foundation row of single crochet; The first pass is the loops and on the second I twist the loop with my left hand while I insert the hook into it for a single crochet; I then add a chain for every chain between the legs of the loop. On the next pass the legs are stitched into that chain space. I call it my LOL stitch because the twisted loops look like cursive lowercase Ls. When I do it with four chain loops they look like cursive lowercase Es. I still call it LOL. This stitch is great for scarves and blankets because it creates a spongy effect with lots of trapped air which allows it to create more warmth than the lacy look would lead you to expect. It also works up really fast and is one of those stitches and patterns that you can work while thinking about something else. Even while watching videos. Some might call this monotonous or mindless but I find it allows me to become mindful when I'm stressed or anxious. It is also nice to pick up when I'm too tired to work on something complex. Thus I call it meditative. 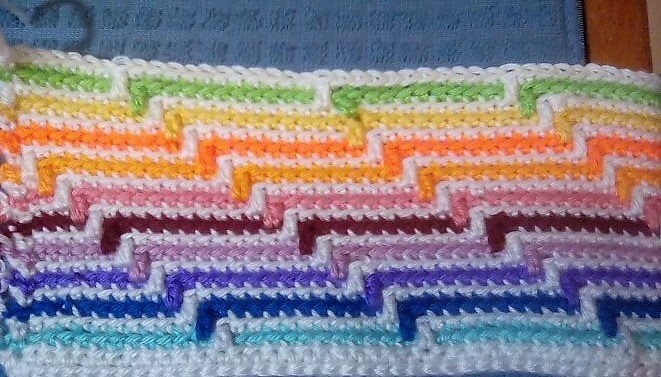 My sister asked me to crochet some towel holders for her. She was picturing them crocheted directly onto the towels but I came up with this concept. It is not unique as I found examples of it on YouTube after I started picturing it in my mind. I didn't follow a pattern; I did what I call sculpting. I guess everything on this page was sculpted except the self-striping scarf. The smaller one was the first and was a riff on one of my bookmark patterns. 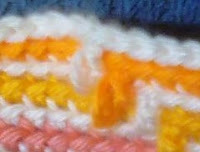 I used size 10 cotton crochet thread in orange which is the counter color in Mom's kitchen. Not because she loved orange but because they got a good bargain when they installed them in the late 1970s. She softened the loudness of the orange by using lime green, yellow and turquoise in as many objects in use and on display as possible. Hence my choice of yellow for the second attempt after the orange one proved to be too small. We're still looking for another use for it in the kitchen as the orange belongs nowhere else. I'm thinking maybe attach a pen to the loop and mount it near a notepad. I'm always looking for something to write with in that room and tho there are lots of pens and pencils in there they are never in plain sight and never where they were last left. Well at least not by the person who is looking for them. The yellow one is actually Lilly's Sugar and Cream yellow and white ombre. This one works great and she's asked for another. The buttons I used are from Mom's vintage collection that she inherited from her mother and which I've confiscated. There are buttons in there from as far back as the early 20th century if not earlier. I've blogged about them many times. Both of these were made for myself. The top one was the first project on my Martha Stewart loom and was my very first loom knitting project. I finished it within days after I started it in mid August. It was supposed to be a beanie. It is a bit of a mess but I've decided I can wear it when I feel like looking comical. 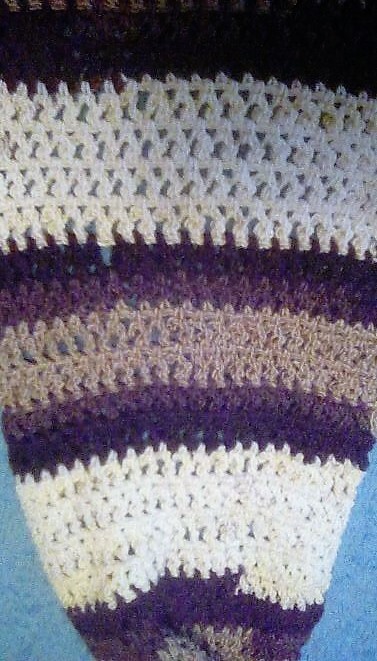 It ended up with a brim because my early rows were much looser than the rest and when I crocheted the edge onto the cast on row it added to the diameter also. Besides that issue pins had popped off several times and I didn't catch the right loop when putting them back in and did not realize that until the runs showed up after the rows showed up below the rim of the loom. I repaired the runs by using a crochet hook and in one bad case used the brim yellow to crochet a chain thru the fabric around the pucker created by my repair. It looks like a patch. Thus I call it my Hobo Hat. It was too small for me when it first came off the loom but after I cut my hair a couple of weeks later it fit OK tho a bit snug. I may give it to a child with a sense of humor. It could be part of a Halloween costume. The hat below was also sculpted rather than following a pattern. 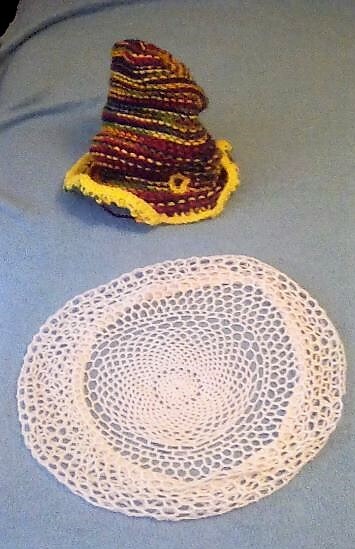 Itcan be worn as a beret, a beanie or a hairnet. I began it over two years ago and kept messing up the increases and would take out rows as soon as the distortion became obvious. Sometimes that was many rows. Once I'd even put the shell edge on thinking it was done only to discover that edging had made it look like a shower cap or one of those hats the girls wore to bed in Little House on the Prairie. Not what I wanted so I took it out all the way to palm size. The final result was arrived at by dropping the usual increase method and using stitch size with tension and number of chains and every once in awhile would double the number of loops while decreasing their size by half or more. All of that is near impossible to see in this picture. I should have had it on a higher contrast surface for the photo shoot.